I have been a packing fool all week, going through the house from top to bottom, de-cluttering the attic and garage, separating our belongings into four piles: pack, trash, donate and sell. We're having a moving sale today. I will let you know how it went. During my breaks from being wife, mom and unpaid packer, I finished reading The Last Warner Woman. The book was beyond engrossing, it moved my spirit. I'm sending it to my mom next. I've also been making time for people. My dear friend Cheryl drove up from Corpus Christi to spend Friday with me and the kiddos. We then held a bon voyage brunch at our home on Saturday. Speaking of time, I have decided that Friday nights are my mom-me time. I have created a home-spa area in my bathroom with my favorite beauty products. I take a long shower, wash my hair, shave, exfoliate, give myself a facial, and moisturize. It's awesome! It's official. Marlie is growing up. I tried to keep a lid on this, but it's time I face reality. Marlie has a crush on a boy at school. How do I know this? She talks about him constantly, draws him pictures, and takes him "presents." I was not prepared for her to be crushing already. What if her feelings get hurt? So I brought it up to one of the school leaders and he told me that they act like an old married couple. I felt relieved because it seems that her puppy love feelings are being reciprocated. Magoo had a rough week. He was gassy and it made him fussy. He didn't sleep well, plus he didn't have a bowel movement for days. I know breastfed babies can goes days without pooping, but I imagine it just contributed to his discomfort. He finally dropped a load Wednesday evening and he was instantly smiley. What else? He has outgrown his 0-3 month bodysuits and he is going through baby baldness. Oh how I'm in love with that sleeping babies pic! What a sweet picture! They are growing so fast. Love your spa night. I may steal that idea for myself. I love that picture of them too!! So precious when they're sleeping, aren't they? Can't believe Marlie's old enough to have a crush! Wishing you the very best with all the packing/boxing up/selling. Awww them sleeping is adorable. I would hate to think of packing. My daughter has a crush on Sonic the hedgehog and chewbaka on star wars. Weird. Please let us know how your moving sale went. Wait. Did I miss something? Are you moving? Marlie has a crush... that is so cute (NOW... when they grow up, it's not so cute. LOL.) I think it's funny that she draws him pictures. So cute. Sorry to hear Magoo was gassy this week, BUT happy to hear he's feeling better. Wow! You've got so much wonderful stuff going on, and I'm so thrilled to see you take it all in AND make time to be with friends, etc.--wonderful, sis! Ms. Marlie is growing up, indeed! I'm telling you, our babies move at a much faster pace than we did, and sometimes all we can do is laugh, pray, and be particularly attentive to their ever-evolving selves! 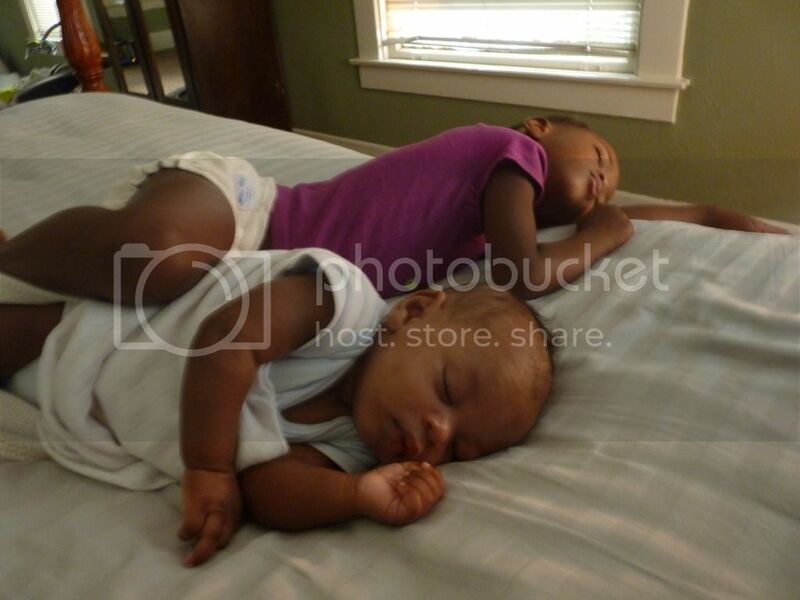 Such a cute pic of them knocked out in bed too! Wishing you well, Teresha mi love! YAY! So glad that you enjoyed the book AND that you're sharing it!! Love the cute photo! It's great that you're able to get some mom-me time each week. Hope the move goes well, moving is such a pain. Book Bash Bonanza! $500 in Prizes! Monday Morning Parenting: Is Teasing Bullying?